A new train connecting Barak Valley in Manipur and Mizoram to South India, Silchar-Thiruvananthapuram Express was flagged off by Rajen Gohain, Minister of State for Railways in Silchar on November 18. 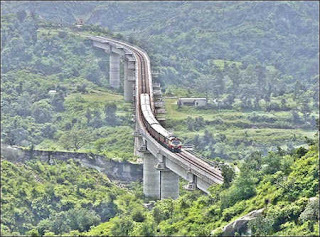 The train will run on a weekly basis with 24 coaches consisting of two GSLR, one General class, one General chair car, fourteen Sleeper class, four AC-3 tier, one AC-2 tier and one pantry car. 12508 Silchar-Thiruvananthapuram Express will leave Silchar at 7:55 pm each Thursday to reach Thiruvananthapuram on Sunday at 8:40 pm. The corresponding return journey would be train number 12507, departing from Thiruvananthapuram every Tuesday at 4:55 pm and arriving at Silchar at 7:00 pm on Friday. 12516 Silchar-Thiruvananthapuram Express will depart from Silchar at 7:55 pm every Tuesday to reach Thiruvananthapuram on Friday at 8:40 pm and its return journey as train no. 12515 will depart from Thiruvananthapuram every Sunday at 12:40 pm to reach Silchar at 5:15 pm on Wednesday. The Silchar - Trivandrum express will cover 3935 km in 74.35 hours and will pass through Badarpur, New Halflong, Maibong, Lumding, Hojai, Guwahati, New Jalpaiguri, Howrah, Kharagpur, Cuttak, Bhubneswar, Visakhapatnam, Vijayawada, Katpadi Jn., Salem Jn., Coimbatore and Chennai Central stations.